In conjunction with the Antique-Wash Style we offer many different cover designs in a “Pictograph” style. These designs are reminiscent of the rock art pictographs of the “ancient ones” of the American Southwest. 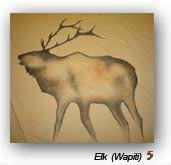 Pictograph refers to the rock art that was created by actually painting on large rock surfaces. We believe that the purpose of the rock art was not to portray the exact physical form of an animal or spirit being, but rather to capture and communicate the spiritual essence or life force of the subject itself. 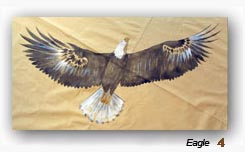 This intimate connection with the inner spirit of the animal beings was what the pictograph artists were trying to portray in their rock art. 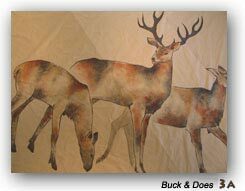 In the soft, sparse colors and the clean, simple lines of pictograph art the inner essence of the animal beings seems to have retained the haunting, timeless beauty of their spiritual origins. In 1996 a white buffalo was born in Wisconsin. 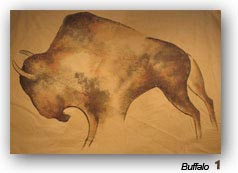 Lakota legend says that if a white buffalo was ever born it would symbolize a time of great change. When you order a group of buffalo, if you would like, we will paint one white buffalo head for you for free, wishing you and all living creatures a positive and peaceful future. 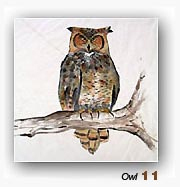 We offer a number of birds and animal figures in a modeled pictograph style. 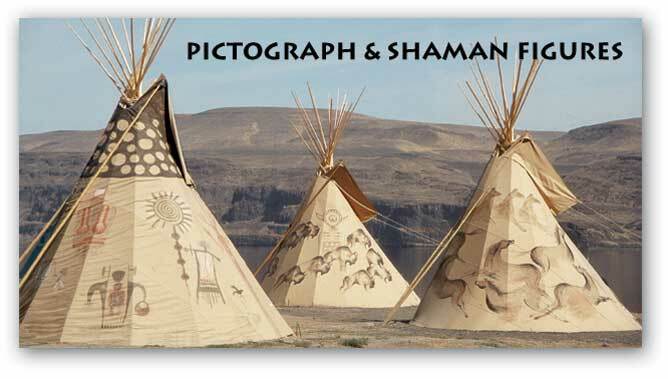 In #10, you get four Raven Silhouettes, and you can place them around the tipi as you wish. 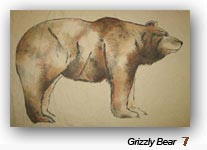 Notice that we do not always draw the entire outline of the form. 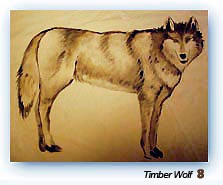 This is in keeping with the original style of painted pictograph art. The other dominant theme of rock artists was the Shaman figures or Spirit beings. 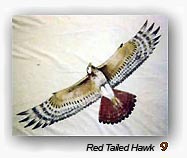 Our figures are exact replicas or adaptations of ancient rock art of the Southwest. With few exceptions all native and aboriginal cultures around the world have always believed that spirit beings are the original true source of all physical beings. This includes not only human beings and all other livings creatures but everything in existence as well: trees, grasses, rocks, rivers, mountains, canyons, deserts, the sun, moon and stars, and even moods and attitudes like humor, sadness, courage and fear. The presence of these powerful yet benevolent spirit beings had a great significance in ceremonies, rituals and in every day life. 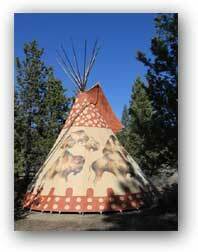 For example, here is a photo of our own Raven Tipi (18ft., 20 oz. All Weather fabric). 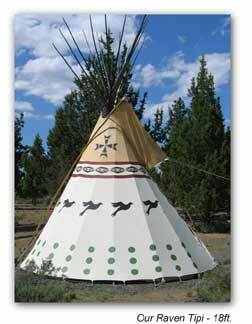 Here we have utilized the raven from Shaman figure # 22 as a band motif around the middle of the tipi. The exact positioning of this band creates a unique feature when you are inside the tipi. 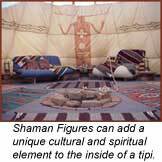 If you have a personal guide or Shaman spirit that you would like to have represented on your tipi, please let us know. As with all the designs that we offer, you can rearrange and recombine them in any way you would like. 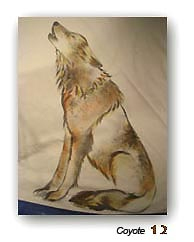 See our artwork pricelist for prices.